The tenascin C gene attracted their attention, because it is significantly more active in the vicinity of malignant nodules than in samples without pathological findings. 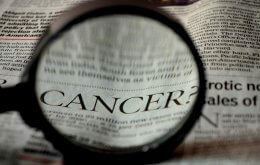 Its increased gene activity might be used for enhancing the diagnosis of lung tumors. Patients with unclear symptoms of the lung and respiratory tract are frequently referred to spiral computed tomography (CT) scans. 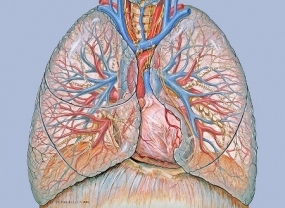 In such CT scans, physicians often discover individual suspicious pulmonary nodules. Fortunately, these so-called “round lesions” are often not malignant. However, if there is a suspicion of such a severe disease as lung cancer, it is vital that such a finding be clarified reliably. Researchers in the team of Ruprecht Kuner and Holger Sültmann of DKFZ, NCT and the Hospital for Thoracic Diseases, all located in Heidelberg, were searching for biomarkers that might help physicians determine the nature of such tissue abnormalities. Their hypothesis was to find cells in the close vicinity of a suspicious nodule whose altered gene activity might be an indication of a malignant tumor. The group studied bronchoscopic microsamples of 71 patients with suspicious nodules. The samples – cells and bronchial fluid from the close vicinity of a suspicious lesion – were collected during a bronchoscopy exam which was necessary for medical reasons. Taking such a microsample with a tiny brush is much less stressful for the patient than surgical removal of a tissue sample. 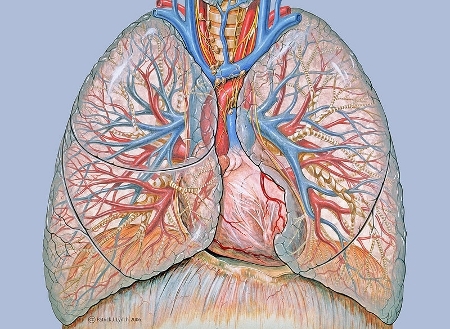 Microsamples collected from the other lung without findings were used as controls. Four genes that are involved in many cancers were found to have a significantly increased activity in samples from the surroundings of lung cancer compared to samples from the vicinity of round lesions that turned out to be benign. The researchers found the most significant association with lung cancer for the gene coding for the tenascin C glycoprotein. In a healthy organism, tenascin C occurs primarily during embryonic development, but it is also found in some cancers around the tumor. „In the samples of the lung without finding, there was almost no difference in the activity of the tenascin C gene between study participants with benign nodules and those with malignant ones,” Ruprecht Kuner explains. „Therefore, strong activation of tenascin C may be a clear indication of a malignancy. “ The predictive value of tenascin gene activity may be further increased by combining it with other parameters such as the size of the nodule. The investigators are now planning to validate the reliability of this biomarker in a larger group of patients.